Just a safety warning – we have had a large number of ducks die on the lake. It is believed to be something that is only affecting the birds (not the fish) that is killing them. Just as a precaution – please don’t feed the ducks/geese or go near them. The Environment Agency have been out and told the anglers not to do any fishing: the lake has been closed to anglers. The Environmental Health people are coming out this morning. It might be advisable to keep dogs on a lead in case they go in the lake to cool off, or find a dead duck. 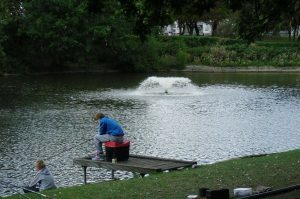 The Angling Club are to be congratulated on noticing the problem and taking immediate action. Well done to them. We’ll keep you posted. is it toxic algea or the run off from all the pesticides and fungicides that the council spray? We won’t know until tests have been confirmed by the authorities. The council and the Friends of Sandall park do not use pesticides in the park as part of management plan for the Green Flag Award. We hope this is resolved soon but we are in the hands of the authorities. Thanks for your concern and suggestions.